Add pure yeast, Durum wheat, salt, water, use only natural native ingredients, thousands of years’ experience and Voilà! you have Matera Bread. 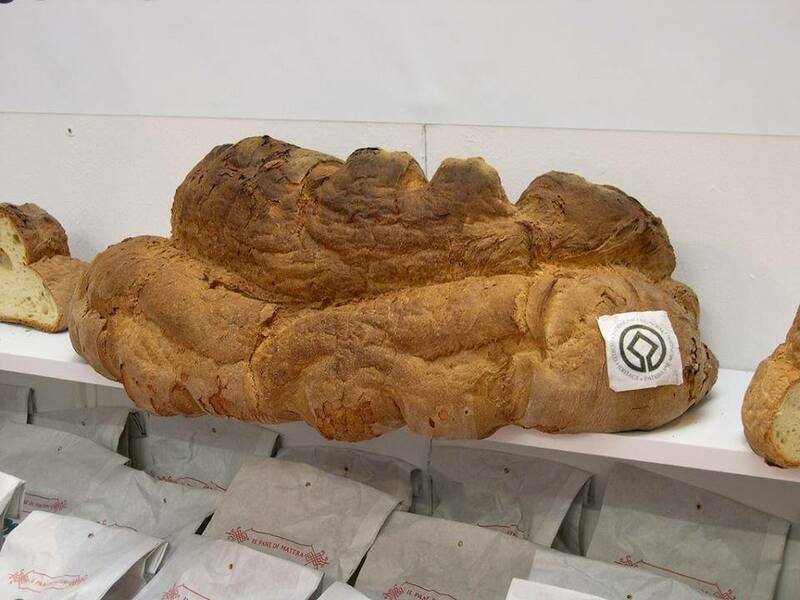 Matera Bread sits on a thrown as one of the dietary products of the Mediterranean historic traditions. Its distinguished and unforgettable flavour, aroma, brown crust and pale yellow crumb pushed this regional product of Southern Italy to distinction among the big variety of Italian breads. It is an extraordinary bread once pelleted with salt cheeses and omelettes, and breakfasts sweets such as honey and jams. Another feature that adds to its superiority over a multitude of Southern Italy breads is its conical shape, that brings to mind the mysterious and harsh Le Murge; the mountains that traverse the province of Matera. The secret of its flavour and long shelf life is in the special preparation of the pure yeast which is made soaking fresh fruits in pure spring water. the pure yeast is extracted from this potion several times. The flour, another ingredient of distinct taste, is obtained from ancient species of wheat with unadulterated genetic code not present in other types of wheat. It is the code of the land of Matera, and its splendid fields of corn stretching to an infinite horizon, an endless fertile desert stretching from Irpinia to Foggia till Lucania. The array of areas are unknown lands because they do not fall on the Italian coast, on the contrary, they are engulfed and penetrated by steep mountains. Southern Italy, a place where you can see many cities and a handful of countries that were subjected to waves of immigration and abandonment. No surprise, life goes on to breathe life into those places thanks to ample examples of agricultural and alimentary excellences such as Matera bread; a bread which gained great fame forged by the local inhabitants after being dispersed across the four corners of the globe especially in the United States, Germany and Australia. The oddly shaped loaf gained fame due to its unmistakable aromatic flavor, its special spongy crumb formed by a slow leavening process to be later baked in the fire of natural wood. It’s a bread that can be stored for 7-9 days, a relatively long period due to the special yeast and the fine Duro Lucano or Capeiti Appulo wheats. Thanks to an ancient search for the most suitable wheats, Durum wheat – mainly used in making fine pasta – is the driving factor behind the intense overwhelming flavor and the special preservative. The loss of water that occurs during the following days make this bread even more tasty. The legends maintained for centuries that the bread is made among the rocks of Matera, in this desolate enchanting land, even the breeze lends its earthly scent to become the unforgettable aroma. No wonder that Sassi De Matera, the forging place of Matera Bread was plced under UNESCO protection as one of the astounding dwellings engraved in stone. 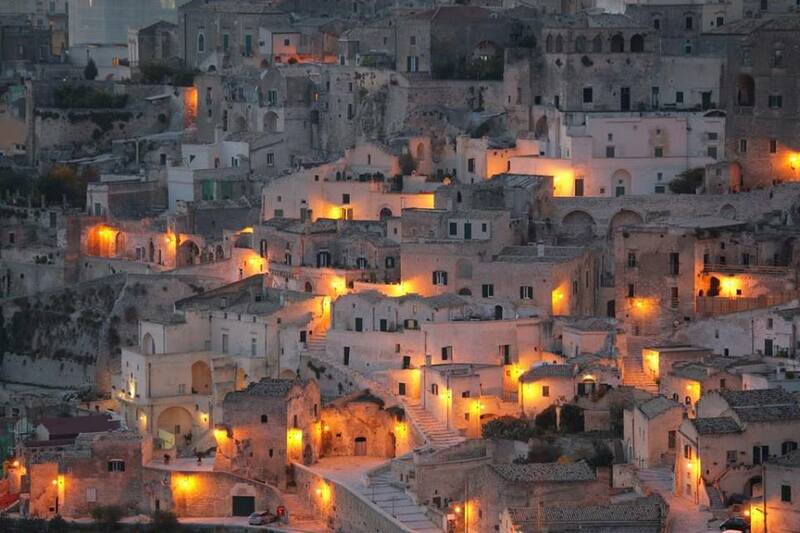 Sasso Caveoso and Sasso Barisano), two districts in the city of Matera are unparalleled example in the world of rupestrian settlements, a natural work of art shaped as intertwined assembly of caves by hundreds of thousands of artisans motivated by the urge to live with whatever nature offers. The bread is baked three times a day whereas each family must book its turn at the baker’s oven a day ahead. In the past, the bookings were done through one of the bakers; the man had to roam the steep streets blowing his whistle and declaring that “Bread shall be baked at 6:00, 8:00 and last round is at 10:00 in the morning”. This is a pure example of how technology was shoved into local crafts by the greedy hands of exporters, a good plan for a product with long shelf life. However, technology was not allowed to mutilate the ancient craft; on the contrary, it faithfully reproduced the hand-made dough. Yes, the bread shaped in the mountains of Matera, made with pasta wheat captivated the whole world with its zest. No elaborate display schemes are needed, the loaf presents itself via its unique shape and the “long storage” feature. As usual with all baked goods, the best part of the story is when the loaf is handled by the hands of the craving customer while wrapped in special preservative plastic which allows the bread to breath. The emblems by the bakeries of Matera reminds one of the Durum when one sees the symbols and colors of that wheat. Of course, those emblems never fail to exhibit strong references to the land of Matera and its aromatic rocks.